Powers/Abilities: He is the ruler of the Realm of Madness. He can transform into anything the insane could think of. He can read the minds of the insane and manipulates them through their fears. He can do this in their mind or by manifesting the fears into tangible form. Everyone who goes crazy will at some point meet Dusk. (Marvel Comics Presents I#123/1-BTS) - Typhoid Mary haunted Dan Ketch in his dreams thanks to the help of Dusk. She told him to stay Ghost Rider and lose his human half, but he didn't want to listen to her. Her dream self disappeared when she swallowed a pill in her real life. When she later went to the bathroom, Dusk greeted her as Typhoid Mary through the mirror and asked her for a favor. (Marvel Comics Presents I#124/1) - Dusk told Typhoid Mary that he could cure her in his realm. She only had to drive Ghost Rider mad so that he would enter his realm. (Marvel Comics Presents I#125/1) - Dusk sent demons into the shopping mall after the Ghost Rider went slowly mad after spilling the innocent blood of Mary. Dusk himself found an appropriate candidate for his plans. He attacked Billy the Security Guard as Typhoid Mary and increased his fear and insanity by doing so. (Marvel Comics Presents I#126/1) - Dusk tortured Billy through voices in his head until he snapped. More of his demons were still entering the mall. (Marvel Comics Presents I#127/1) - Once again posing as Typhoid Mary he attacked Ghost Rider when he entered the Realm of Madness. The false body was shattered and Dusk transformed into Dan Ketch to taunt Ghost Rider. The hero realized that his enemy was Dusk and they fought each other. Dusk used a variety of forms until the Ghost Rider fell from the guilt of spilling Mary Walker's blood. Dusk let Ghost Rider feel the pain of his own penance stare and welcomed the hero to the Realm of Insanity. (Marvel Comics Presents I#128/1) - Dusk watched Ghost Rider walking around in the Realm of Insanity and taunted him whenever he could. He sent many demons disguised as heroes and villains of Earth against Ghost Rider. Meanwhile other demons followed the orders of Dusk to drive the people in the mall insane. 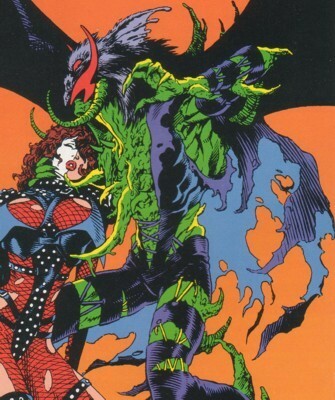 Typhoid realized that Dusk didn't want to help her at all and entered the Realm of Madness to find him. (Marvel Comics Presents I#129/1) - Dusk saw the Ghost Rider losing his mind while fighting the Necromancer. He was sure that he would gain a new warrior in Ghost Rider for his war against Nightmare's realm. After Mary saved Eve from one of his demons, Dusk punished her by using her fear of men against Mary. He let her see Matt Murdock, Logan and her father again and this made Mary so afraid that when Ghost Rider stood behind her she jumped down a cliff. (Marvel Comics Presents I#130/1) - Ghost Rider defied Dusk and left with Mary and Eve the realm of madness. Dusk followed them through the same portal and wreaked havoc in the shopping mall. Andrea and her women attacked him and Father Tarsitino tried to threaten him with holy words. Dusk followed him because holy men were the ripest for madness. Ghost Rider saved Father Tarsitino from the claws of Dusk who continued to fight the hero. Father Tarsitino blessed the water in a toilet on the orders of Ghost Rider who then threw Dusk into the toilet. The holy water burnt Dusk and he was flushed down the toilet. (Marvel Comics Presents I#130/1-BTS) - Dusk returned to the Realm of Madness as its rightful ruler. He didn't go after Ghost Rider again, but he soon found a worthy replacement for him. (Venom: The Madness#1) - Dusk felt a new madness through a portal to the dreams of the mad. He tried to convince Eddie Brock that his bonding with the alien wasn't symbiotic because one had always the advantage. Dusk continued to haunt Venom in his dreams. He mocked him with his fears and promised him that he would love Venom more the more insane he became. (Venom: The Madness#2) - Venom went mad after he was infected with the Mercurial Virus and Dusk was really happy about this. He ordered Paranoia to wait in the hypnagogic limbo where Eddie Brock went when he tried to sleep. Necromancer got the order to welcome Venom when he was in their possession. Dusk continued to haunt Venom in his dreams and he was joined by the virus and other demons of his realm. When Venom fought Juggernaut, Dusk opened a portal behind him and Venom fell through it into the Realm of Madness. (Venom: The Madness#3) - After Venom had defeated Necromancer and Paranoia he was attacked by Dusk. Venom was surprised that Dusk looked like something that was flushed down a toilet and survived. Dusk told him that Venom saw him the way he wished Dusk to look. Dusk sent manifestations of Wolverine and Spider-Man against Venom and looked on as Venom fought them. 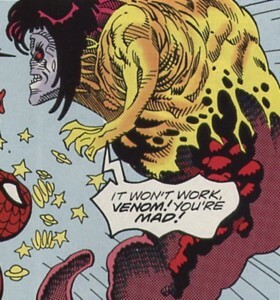 Venom beat them up and realized that he could end this illusionary madness with one thought. Dusk said to him that it wuldn't work because Venom was mad, but the madness of Venom was gone and the manifestations of Dusk disappeared. Venom returned to Earth while Dusk was sure that Venom would return because if Venom wasn't mad the Realm of Madness would've destroyed him. Comments: Created by Ann Nocenti and Steve Lightle, look recreated by Kelley Jones and John Beatty. Dusk didn't appear in the Nightmare mini although two demons of his realm finally achieved his goal to take over Nightmare's realm. Probably he was destroyed by Nightmare at a failed attempt to do the same. Dusk gave himself some names associated with other demons of the Realm of Madness in the MCP storyline. I don't know why he did it, but it sure didn't make him more popular with his underlings. Claiming the fame for others' work isn't the best way for a good climate between workers especially if you are the boss. I added all demons from the realm as his affiliates because he was the boss of the realm. Eve and Andrea's last names were revealed in Typhoid's profile in OHOTMU A-Z HC#12. She was a radical feminist and hated all men just for being male. Mary Walker and Eve were a part of her "Woman's Action Movement" group. She argued a lot with men and tried to convince their wives to stand up against them. The most times she just angered the men and their wives tried to defend them. At the end of the day she got some help from Dan Ketch with packing up, but she didn't like him like the other girls. She encouraged the other woman to wage war against the men when the doors of the mall got locked after a power failure. She armed herself with a hammer and waited for something to happen. She saw in Mary a hero because she killed a man and tried to follower her example. Together with a bunch of other W.A.M. members she searched for an enemy/man. They found the sane spirit of Dan Ketch and attacked him. She and her women stopped the attack when the sane spirits of Eva and Mary were suddenly with Dan. She watched on as the spirit of Mary was fading away and even thought about praying for her. She saw Ghost Rider return with Eva and Mary. Andrea helped the son of the Tarsitino's when he was attacked by Dusk. Together with her women she drove the monster away from the people. When he was a child his father left his mother for another woman. She taught him to hate woman and he did so because he loved his mother. He became a security guard at a shopping mall. Together with two colleagues he harassed Mary Walker one night. Billy was just thrown into a wall, but his colleagues died. Billy ran away through a window and met the wife and son of Louis Tarsitino. He shot at them and everyone else he saw. They were women and he hated them. Bat-like creatures scratched him and Billy ran away. He hid in the shadows and Dusk felt his paranoia and attacked him as Typhoid Mary. Billy lay on the floor in terror after the attack and remembered his childhood. He heard voices in his head and stood up to find and kill all the women. He watched Eve walking by, but she was already attacked by the bat-like creatures and didn't die. When Typhoid Mary fought Ghost Rider again Billy saw his chance to kill her. His bullets didn't hit. She sliced him with a dagger and burnt him, ending his life. Eve was a young pregnant girl. She was alone and part of Andrea's W.A.M. group. She talked to Dan Ketch when she saw him. She thought she knew him from somewhere, but she couldn't remember from where. Thanks to her Dan stayed to help the group packing up when the mall closed. In the bathroom she talked to Mary about the "cute" Dan. After Mary killed two men she couldn't understand why Andrea thought that Mary was a hero. She tried to stop Andrea from becoming a killer herself. Eve searched for Mary when she suddenly disappeared. She didn't find Mary, but a bunch of bat-like creatures found Eve and attacked her. Delusion saved Eve from those creatures and brought her to the Realm of Madness. Eve believed the words of the knight in shining armor and fell for him. Mary arrived and mocked Delusion to free Eve from his influence. At the same time the sane spirit of Eve was now together in the mall with the sane spirits of Dan Ketch and Mary Walker. Typhoid showed Eve her past and now Eve understood her. Dusk attacked them and drove Typhoid over the edge. Ghost Rider brought Eve and the injured Mary back to Earth where they all became one with their sane spirits again. Dusk followed them, but he was defeated. 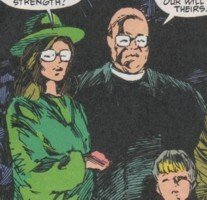 Father Louis, his wife Sally and their son Matt went to the shopping mall. Louis tried to stop the Ghost Rider when he attacked Typhoid Mary, but it was too late. He watched as a portal opened to the Realm of Madness while the Ghost Rider lost his sanity. Meanwhile his wife and son were threatened by Billy the Security Guard, but they received help in Andrea and her group. Louis found Ghost Rider on the other side of the portal. They got back from the Realm of Madness, but portals now opened anywhere in the mall. Louis tried to explain the happenings in a religious way. He watched as Typhoid attacked Ghost Rider. Louis was pushed to the ground by Billy and saw him die. Demons came from the ground and Louis grabbed the hand of Mary to save her. She took the chance and Louis returned with her to the mall. Typhoid brought him back to his family. They soon joined Andrea and her group at the place where the sane spirits of Dan, Eva and Mary where. They watched them return followed by Dusk who attacked everyone in the mall. Dusk followed Louis who got some help from Ghost Rider. Louis blessed the water in a toilet which finally defeated Dusk.